from/ to anywhere worldwide, including professional shipping services, storage of your items, expert removals and much more. Worldwide Moving provide relocation services to move your possessions to any part of the world, from and to any part of the Canary Islands, including internal moves within the Canarian Archipel. From a few boxes of personal effects, to exclusive private containers, you are assured of a high standard and professional service from a dedicated team of personel, who can assist you in many European languages. 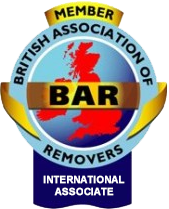 Worldwide Moving is an international associate member of the British Association of removers and have been trading for more than 30 years on the Canary Islands. As our name suggests, Worldwide Moving can export and import effects to any part of the world regardless of size. We offer a variety of shipment options in and out of Tenerife and the Canary Islands. We can transport your items in sole use containers, shared containers or custom made crates. Our removal and transport service is also tailored to suit each clients needs and pockets - from a full service in which we supply all the packing materials and pack every last item (including knives and forks and the bits and bobs which are always lurking at the back of drawers), to a service where we supply the packing materials and you can pack yourself. Alternatively we can just collect your packed goods for onward shipment, the choice is yours! Every clients move is so unique and individual we prefer to view the effects in order to be able to quote the job correctly, to know what packing materials are required, how many men will be needed and most importantly to provide an accurate cost for the move. This method is the best way to prevent any nasty shocks for either you or us on the day of the pack! We can liaise on your behalf with associate removal companies in any part of the world to organize packing from your home as well, taking all of the worry away at this most stressful time. Our expert team of packers and handlers have a combined experience of over 45 years, and we have utmost faith in their professionalism and the extreme care they take when handling your possessions. All our packing materials are of the highest quality ensuring the safest possible journey for your effects. For smaller consignments, or just by choice, we can also send your effects by air freight to most airports in the world. including taking your pets to the airport if you require. Along with your personal possessions we can also transport your vehicles including crated motorbikes, cars, jet skis etc. Contact us today and see how we can help you with your move. Worldwide Moving are able, in conjunction with our worldwide partners, to offer you a home survey from wherever your residence may be worldwide and prepare an accurate quotation for you, up to your new residence here in the Canaries. Worldwide Moving would take care of all the documentation requirements, from whichever Country you are moving, and prepare all the required Customs documents here on the Canary Islands. Our full destination service includes delivery inside your residence and we offer in our service a full or partial unpack, whichever is your preference. All debris will be taken away and recycled. Worldwide Moving have moved many satisfied Customers troughout the world over the last 30 years, to every Canary Island; Tenerife, Gran Canaria, Lanzarote, Fuerteventura, La Palma, La Gomera and the most southerly El Hierro, understanding the Islands and their individuality. Having worked with reliable shippers, handlers & transporters all these years, we know how to import your valuable personal effects at the best, fastest & safest way at the lowest cost. We have the resources to ship your household effects from door to door, to anywhere in the world through our international partners. We have succesfully been working together with these partners for many years. Worldwide Moving can offer you a variety of options for moving from the Canary Islands to any part of the world, by way of our shared groupage containers or an exclusive private container. We have a regular groupage service between the Canary Islands and London but also offer groupage services to other European countries like Germany, Holland, Italy, Belgium, France, etc. At Worldwide Moving we also provide exclusive use containers, from your residence here in the Canaries to any worldwide destination. Our removal and transport service is tailored to suit each clients needs and pockets. From a full service where we supply all the packing material and export wrap all requested items, down to supplying the materials only for you to pack in your own time. Alternatively, we can collect the items that you have packed in your own cartons, providing they are of sufficient quality, to enable a safe shipment. Worldwide Moving will provide a surveyor for a home visit, to calculate the volumes of your consignment and packing material required. We will provide an accurate quotation for your move, taking away all of the worry at this most stressful time. The surveys are carried out strictly with no obligation on your part to proceed. Worldwide Moving have an expert team of international packers and handlers, who have many years experience within the company and we have utmost faith in their professionalism and the extreme care taken when they are handling your possessions. All our packing materials are of the highest quality, ensuring the safest possible yourney for your effects. Our overseas partners will contact you prior to the arrival of your consignment and assist you with the Customs clearance. They will undertake a full delivery service which includes unloading, unpacking of furniture and the removal of waste packing material. Along with your personal possessions Worldwide Moving can also export your vehicles including cars, motor cycles & jet skis for which crating is provided. Worldwide Moving can also take care of exporting your pets to the UK, where our staff will handle all necessary steps, including taking you and your pets to the airport, the despatch through Customs up to cargo acceptance. Moving home within Tenerife? Perhaps you are simply moving to a different island in the Canaries? Worldwide Moving offers the same professional removal service regardless of how big or small a move you are undertaking. Our services can be tailored to suit your needs and pocket from just a basic collection of pre-packed household goods to a full packing service. We always blanket wrap furniture and bulky items even on the shortest trips to ensure the safest possible arrival at your new home. Depending on the size of the move we would transport the goods either using our vans and the inter-island ferries or if the move was larger we would hire one of the inter-island containers and ship the effects using the same method as our International moves. The container would be locked upon completion and would not be re-opened until arrival at residence ensuring a totally safe and secure mode of transport. We have a secure storage depot to facilitate our clients in the South of Tenerife. This depot has been specifically designed to accommodate stored household effects which can be held safely in a constant temperature, free from pests and damp, fully insured against flood and fire and under 24 hours alarm surveillance. Storage can be arranged for long or short term depending on your needs & if required we offer packing, transport & delivery on a date and time which is convenient for you. Our clients are also free to drop off /collect their effects at our Warehouse. Please contact us to discuss your personal storage requirements.